Stay tuned for upcoming events for Shahid Afridi Bats for Pakistan Center in near future. Shahid Afridi is set to Bat for Pakistan Center with Pakistan Association Dubai on 27 February 2017 at Pakistan Auditorium in Dubai, UAE. 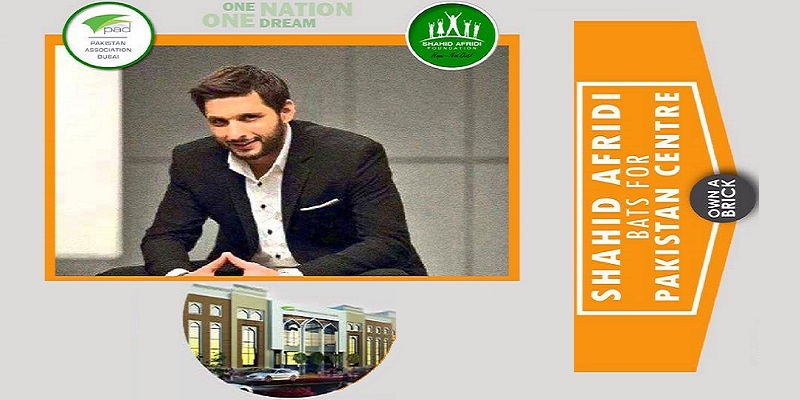 Pakistan Association Dubai (PAD) and Shahid Afridi Foundation have joined hands for Pakistan Center. Own A Brick and be a part of a noble cause alongside Cricket superstar Shahid Khan Afridi. Pakistan Association Dubai has launched a new project “Pakistan Center". It includes four components: Pakistan Medical Center, Gym, Restaurant, Offices Block and Masjid. Main component of the expansion plan is “Pakistan Medical Center” which will be a not-for-profit facility and first of its kind in the GCC countries by any expatriate community. The ground floor will consist of Office Block, Masjid and Restaurant. First floor will house Pakistan Medical Center, Fitness and Rehabilitation Center, meeting rooms and children play area. Pakistan Association Dubai envisions to transform into a prestigious institution that will be a source of utmost pride for every Pakistani residing in the United Arab Emirates. Pakistan Center will be a valuable gift to our future generation. Pakistanis have a tremendous potential to achieve their goals even in difficult times. We hope that with community support we will complete our new projects as One Nation One Dream. Best Viewed at 1024 x 768 pixels and above. This Page loaded in 0.06343 seconds on Fri, Apr 19, 2019 (06:23).